German police rescued a woman after she was taken hostage by an armed assailant at the Cologne central train station Monday, an incident now being investigated as a possible terror attack, officials said. Investigators say the incident began around around 12:45 p.m. local time, when a man carrying several homemade firebombs entered a McDonald’s near the station and ignited one. A 14-year-old girl was severely injured in the bast. The suspect then fled to a pharmacy at Breslauer Plaza, near the back side of the train station, where he held a woman hostage for at least two hours, Deutsche Welle reported. He “massively threatened” the hostage and at one point tried to set her on fire, police said. After crisis negotiations broke down, special police commandos stormed the pharmacy to free the hostage. The hostage taker, who police say was holding a pistol, was shot and seriously injured. The hostage and a bystander were also hurt in the operation. “Special response units overpowered the man. 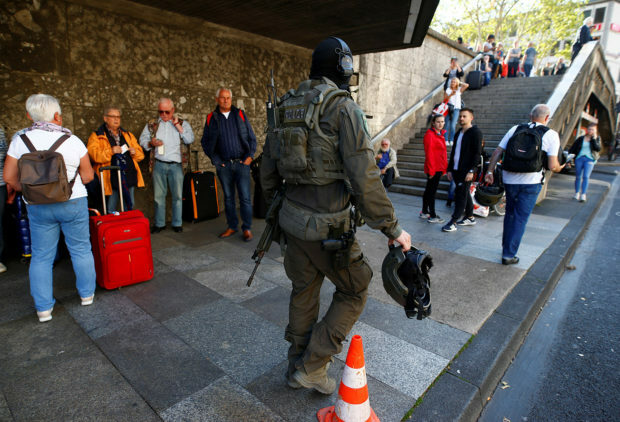 During the police action he hurt two bystanders, one of them seriously,” police said in a statement, according to Agence France-Presse. Investigators said they had not positively identified the attacker, who was being treated at a local hospital, but believed he was a 55-year-old Syrian migrant. Syrian identity documents in the same name as an asylum seeker who had been issued a German residency permit were found at the pharmacy, police said. Germany has suffered multiple attempted and successful terrorist attacks in recent years, mostly perpetrated by attackers claiming allegiance to the Islamic State. An ISIS terrorist drove a truck through a Berlin Christmas market in December 2016, killing 12 people. More recently, German police thwarted a potential chemical attack on the Berlin half-marathon when they arrested a suspected Tunisian jihadist in possession of the deadly poison ricin and bomb-making materials. Several eyewitnesses to Monday’s attack say the attacker claimed to belong to ISIS, police said, according to NBC News.